People gather at a café in Melbourne where conversation is as much a focus as the coffee. MELBOURNE, Australia — Wearing a leather apron over a starched white shirt, Bowen Holden leans across the marble-topped bar and prepares a perfect flat white. The local specialty is made by pouring steamed milk laced with tiny bubbles over a single shot of espresso, and today it’s fueling a hubbub of conversation in this narrow café with its black wooden floor and clean white walls in a former barristers’ chambers in the city’s legal district. The attention to detail here extends beyond the product. It includes the fact that there are no seats in this café, and no place for laptops, spurring regulars and visitors to do something you don’t often see in an American coffee shop: have conversations with each other, standing at the bar or leaning up against the sills of open windows, and with Holden and his fellow baristas. This is the kind of thing that makes independent local coffee shops ideal places to experience the culture of a travel destination — cafés in Paris, espresso bars in Italy, coffee rituals in the Middle East, walk-up windows at Cuban restaurants from which potent Café Cubanos are dispensed. 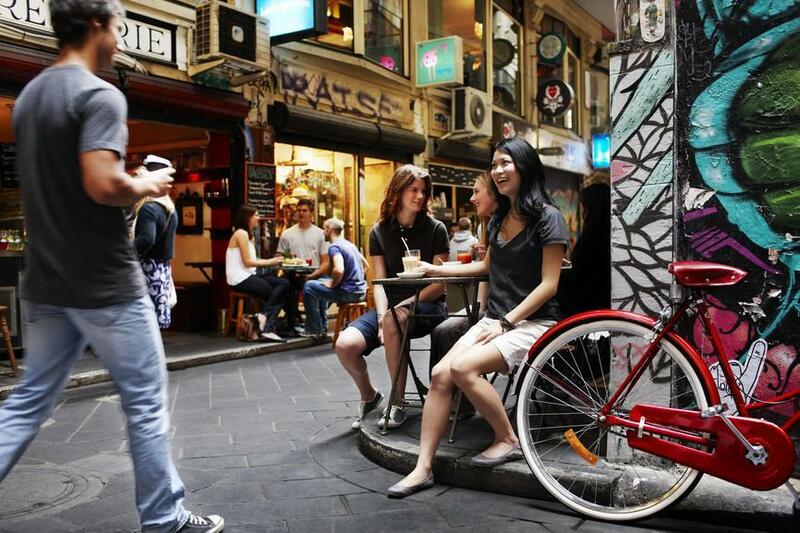 And if some of the best cafés are hard for visitors to find — in Melbourne, for example, often hidden behind nondescript doors along the labyrinths of laneways, or alleys, once used by horse-drawn delivery carts — a whole other industry is percolating up to help them. Coffee-centric destinations such as Melbourne, Seattle, Oregon’s Portland, and even Columbus now have café tours organizers say primarily attract travelers. Growers in Panama, Costa Rica, Colombia, and Hawaii offer visits to coffee plantations. There are public coffee expos, tastings, and coffee-making workshops. “Coffee has become a tourist attraction,” said Maria Paoli, a barista trainer and owner of Melbourne Coffee Tours. People who track developments like this one say the numbers bear her out. “There’s a lot going on with the idea of coffee and travel, and experiencing a place through coffee,” Friend said. It’s also very, very popular. More than a billion people drink coffee at least once a day, Euromonitor reports — more than anything else except for water. That ranges from a high of more than 19 fluid ounces per day, per person, in the Netherlands to more than 14 in Finland, to about 8 in the United States. And specialty coffee shops are the fastest-growing category of food service establishment when judged by global sales. “There really is something real here, where consumers all around the world are going out for coffee, and they’re going to coffee shops for a lot more reasons than they used to,” Friend said. While some of the growth is being driven by big international chains, there’s also pushback against them in many places in favor of the independent shops that best reflect the local culture — and the idea of coffee as a social experience. Starbucks, for example, did so poorly in Australia, it has fallen from a peak of 84 stores to 25. “It’s almost an offense to ask a friend to coffee and mention the word Starbucks,” said Paoli. And no one in this country runs on Dunkin’. “I’m looking for an authentic experience when I travel, and I think you find that at a local café more than you would at a Starbucks or a Dunkin’ Donuts,” said Lora Woodruff, who runs Third Wave Coffee Tours in Portland. Americans seem surprisingly predisposed to this. Only 11 percent think coffee from the big chains is better than what they can get in independent shops, a survey by the market-research agency Synovate found. That’s the same level of low regard for chain-bought coffee that Australians have. But while a selling point for chains is their consistency, rooting out the best independent coffee shops while on the road can require an educated nose and a heavy dose of caffeine. Demand for Woodruff’s tours has grown so much, she’s hired three other part-time guides. Paoli apologizes for excusing herself to lead her day’s second tour. Both say their many guests are mostly visitors. There are coffee tours in other places, too, ranging from a $30 coffee tour of Seattle by Seattle By Foot to a $50 outing in Columbus by Columbus Food Adventures. Brisbane has Bean Brewding Specialty Coffee Tours by bike or foot. Most of these include visits to roasters and tastings at from three to six cafés. Several coffee plantations in Hawaii have tours, too, and the Kona Coffee Cultural Festival is held there each November. Melbourne hosts the Melbourne International Coffee Expo, which is open to the public. There are tours of coffee farms and processing plants in Panama, Costa Rica, and Colombia, and several travel operators offer eight-day, seven-night Colombian “coffee experiences” for diehard caffeine addicts. Off a laneway back in Melbourne, bearded hipsters in ironic T-shirts find their way through a huge wooden door in the brick wall of a former sawmill off a laneway, and into the Krimper Café, named for a Hungarian furnituremaker who immigrated to Australia before World War II, and decorated with some of his work. The coffee here is served in tumblers, with tasting notes that promise hints of caramel peach and unrefined panela sugar. A smaller but stylish Melbourne café, called Captains of Industry, occupies a former textile factory above a tattoo parlor. Customers sit at reclaimed industrial sewing tables. The owners are friends who used to be bartenders. And there’s not a laptop or cellphone in sight. “Once there’s a good coffee shop and the standard is raised, how could anybody not go there?” one patron said, seemingly incredulous that this would even be up for debate. Her friend is equally dubious that anyone might forgo the urban chic of a place like this one for a chain café, or that people in a coffee shop wouldn’t take advantage of the chance to do what this pair is doing: have a chat over a flat white.